Welcome to an update with Kathy Ennis of LittlePiggy, formerly Kathy Ennis: Your Brand is You. Kathy joined this interview series in n May 2012 and updated her story in July 2013 and August 2014. We last chatted in February 2016, and at that point, when asked where she wanted to be in a year’s time, Kathy said, “You reminded me, Liz, that in 2014 I said “Bigger, better, bolder!” and to be honest I don’t believe I can think of anything better so I am going to stick with it through 2016.” So, is she bigger, better and bolder this time round? Read on to find out. Hello again, Kathy, and welcome back. Are you where you thought you’d be when you looked forward a year ago? Not really. During 2015/16 I realised that my business had moved in a slightly different direction. Although I was still working with business owners on their brand / personal branding, I was also being asked to help with their engagement marketing and general business systems and processes. Also, increasingly, I was delivering training in these areas for both organisations and enterprise agencies. The upshot of these changes was, in the summer of 2016, I decided to rename my business to reflect these changes. I also carried out a complete overhaul of the brand and key messaging. The upshot is my new business: LittlePiggy. I am still working 1-2-1 with clients, but I now work closely with a few Enterprise Agencies on the delivery of their mentoring and training programmes. This is the side of the business that I want to grow. I don’t think I learned anything in 2015/16 that I didn’t know – because what I did is what I work through with my clients – but it has given me more practical advice and experience that I can impart to my clients. Plan any changes fully. Because I sat down and worked out precisely what I wanted / needed to happen; the timescale; researched people / organisations to outsource to (web design etc.) it all went really smoothly. It only took two weeks for it all to happen once the planning was complete. I may be moving home in the next 12-months so, although I am planning, things may be disrupted because of that. However, my plan is to increase the amount of work with Enterprise Agencies, or other organisations that offer training and mentoring support for small and micro businesses. I admire people who can pivot like this and make brave and bold decisions – and I also admire people who plan first! Kathy did both of these things, and as you can see, it paid off for her. She has a great logo now, too! Another troublesome pair from near the end of the alphabet – and while we’re talking about alphabets, I’ll admit now (and sadly it will probably be true for any future readers, too; you’ll be amazed how many people search for these pairs years after I posted them) that I’m a bit behind with updating the index. However, if you use the Search feature (under menu on a mobile or in the right-hand column on a desktop) you will be able to find all of them. If you are venal, it means you are susceptible to bribery, for example a corrupt politician or town planner. Venial is quite different: it is used in a Christian context to describe a sin which is not seen as removing divine grace from the soul. It has therefore also come to mean, by extension, slight or pardonable, although I can’t personally recall seeing it used in this way in a non-religious context (or without any reference to religion) and I would advise using slight or pardonable instead if you want to use it in a secular context unless you’re very sure your audience will understand it. Additional point: venial sins are contrasted with mortal sins, which are terrible, grave sins which do deprive the soul of divine grace. This is a quick reference round-up how to and how not to covering how to stat a new line, how to start a new paragraph, how to start a new page and how to indent a paragraph in Word for Windows. I have covered all of these in detail in various longer articles which I’ll link to as we go along. Why all the fuss? Why can’t I do it my way? If you are formatting a document to be used by someone else, edited and changed or, especially, printed, it’s vital that you use the standard ways to lay out your document to prevent it getting into a mess or someone else having to reformat it (which could be expensive if you’re paying them). 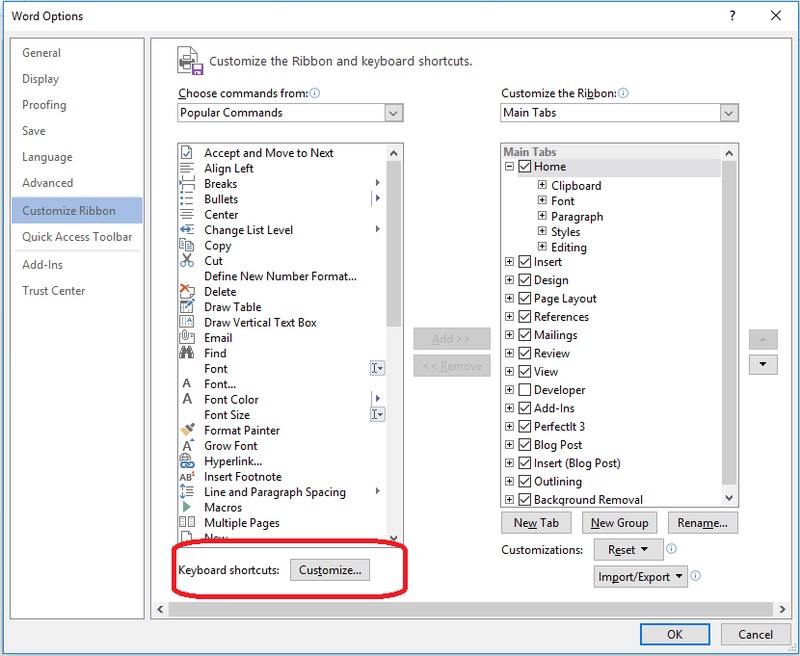 In addition, certain methods, especially using Enter to start a new line, can make your document messy as soon as you enter extra text before that line break (see the relevant article for details and examples). This article has summarised how to start a new line, paragraph and page and indent a paragraph correctly in Word. 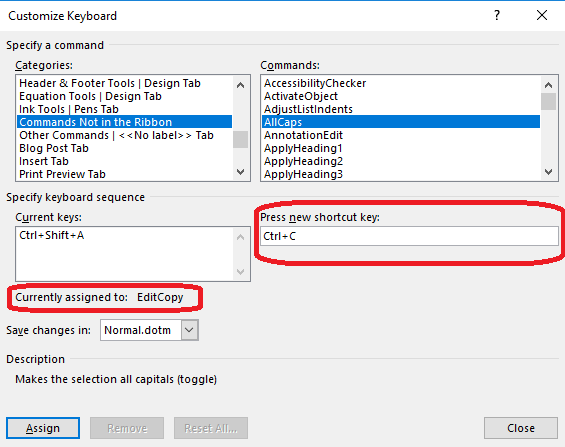 How do I assign a shortcut key in Word 2010, 2013 and 2016? 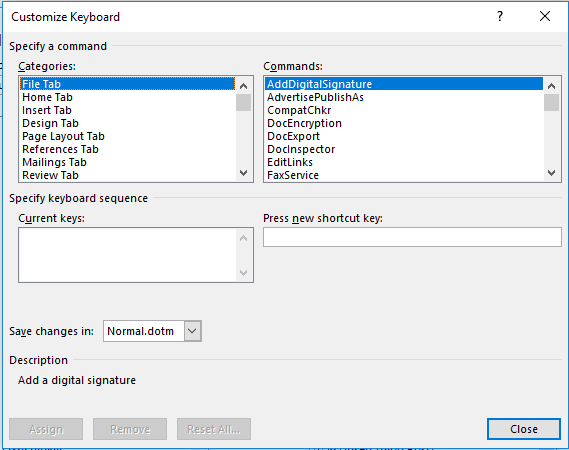 In this article we will learn about assigning shortcut keys or keyboard shortcuts or short-cuts in Word 2010, 2013 and 2016 for PC. Please note that these instructions are for these versions of Word and might not work in the same way on a Mac or in an older version of Word. What is a keyboard shortcut or shortcut key? A keyboard shortcut allows you to use the keys on your keyboard to do tasks that you might normally need to use your mouse for, or which are buried deep in layers of menus. Click a couple of buttons and you have done what you wanted to do. What is the purpose of assigning shortcut keys? The clue is in the word “shortcut”. Assigning a keystroke or two to carry out common tasks will save time and is also used by people who need to use the mouse less, for example if they suffer from or are prone to RSI. Are some actions in Word covered by shortcut keys anyway? 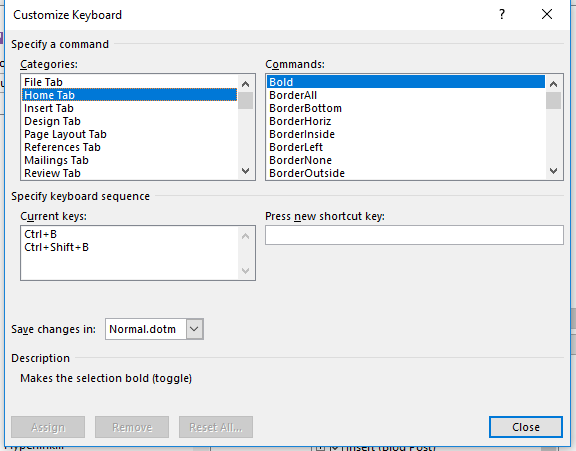 Yes, some actions in Word are already doable by using keyboard shortcuts. For example, you can copy text by pressing Control and C at the same time, or paste it somewhere using Control and V. You can also look for text pretty well anywhere there’s text by using Control and F together. What we’re talking about here is assigning a new shortcut key to an activity that doesn’t already have one – or assigning a new key to a different shortcut. How do I assign or change keyboard shortcuts? To assign or change keyboard shortcuts or shortcut keys, you need to access the Customize Ribbon menu. See this article for screenshots and more detail. Now click on Keyboard shortcuts: Customize. However, if you move to the Home Tab (by clicking on it) you will see some more familiar items – and note that they’re in alphabetical order. Here you can see under Current keys that Bold has the shortcut keys Ctrl+B and Ctrl+Shift+B, which means that you can hold down Control and the b key at the same time, or Control and Shift and the b at the same time to make the text that’s highlighted or the next text you type bold. You might have known how to do that already: here is where that shortcut can be set, removed or changed. If you scroll down the list of tabs, headed Categories, you will find one called Commands Not in the Ribbon which is a useful list. Let’s say I wanted to change the shortcut for AllCaps (i.e. to change the highlighted text or next text I type to be ALL IN CAPITALS). What if the shortcut key I want to use has already been assigned? Here we can see that Ctrl+C is already assigned to EditCopy. If I assign Ctrl+C to AllCaps, it will then move over from EditCopy to AllCaps and will no longer be available for EditCopy. Of course, this might not matter, if the other command is one you don’t use anyway. If you want to assign this shortcut, go ahead and press Assign. The shortcut will move into the Current keys section. How do I remove or cancel a keyboard shortcut? If you want to remove the keyboard shortcut you’ve just created, or one that you keep hitting by accident, highlight the one you want to remove and press the Remove button beneath it. Note: if you’ve reassigned a shortcut key and want to put it back to how it was, you will need to find its original command and add it back in there. How do I save my keyboard shortcuts? When you’ve assigned your shortcuts, press the Close button on the Customize Keyboard menu and the OK button on the Customize Ribbon menu. Note: you can save changes in a new template, if you want to keep your standard Word template as it is. Drop down the Save changes in: list to do that. 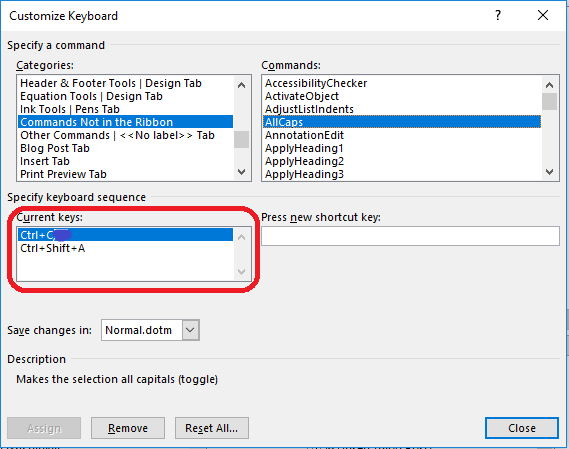 In this article I’ve explained how to assign and remove keyboard shortcuts or shortcut keys to give a short cut that will save your mouse hand. If you’ve enjoyed this article and found it useful, please share using the sharing buttons below, or comment if you’ve searched for it and used it and I’ve helped you. Thank you! Hello again, Matt! So, are you where you thought you’d be when you looked forward a year ago? Broadly, yes, I am. Some things have gone better (revenue and world ranking, to name two) and some things I still need to address my mind to this year. I’m certainly considering taking on my first employee, which is an exciting (daunting?!) step. I’m currently reviewing the option of taking on an apprentice and looking at various council schemes that might make this decision an easier (financial) one. In my first full year of trading I became the World’s Number 2 Solutions Partner. This means that I sold the 2nd greatest number of licences of QuoteWerks partners worldwide. This exceeded my expectations as I thought getting into the top 10 would be a great achievement. I also won the individual award (QuoteWerks MVP). The number of clients I have has significantly grown, both in the UK and the US. This has meant I’ve had to get clever at how I keep in touch with them to ensure that they’re still happy with the software. This has included regular mail outs with surveys and new feature details. I often use YouTube to link to videos of new features so they can see them in action, as opposed to just reading about them. The growth of US-based clients has meant needing to work occasionally into the evening to virtually ‘meet’ with them during their office hours. In terms of staying the same, the needs of businesses that could use my solution are still the same. What has always proved difficult, and still does, is making businesses aware that software like mine exists and being able to make them aware of why they need it. With my software being bought in US Dollars, the exchange rate changes has increased the price of my software by about 20%, most of which I’ve had to pass on to clients. This has created one or two slightly uncomfortable phone calls with existing clients. There are several services I’ve implemented such as using Moneypenny to answer calls when I’m unavailable. This was recommended to me by a client, as they use the service as well. For £30 a month, any calls I can’t take don’t go through to voicemail but they get to speak to a real person that will advise my status (I can put comments such as, out of the office today, will return their call when I’m available at 1600). This gives a much more professional view of the company and people often comment “I’ve left a message with your colleague”. All my finance/tax/payslip tasks are also outsourced using March Mutual, another recommendation from a client. This means that at the end of the month, having logged all my invoices/expenses and when payments have been received, I get a payslip telling me how much money I can take out from the business and what needs to be set aside for things like Vat and Corporation Tax. Saying “no” is still something I’m quite bad at. When I had a feeling that a client wasn’t right for the solution, or they wanted a scope to include X and Y for a price of A; there have been a couple of occasions where I, with hindsight, should have said no or stood my ground. Services like Moneypenny, March Mutual and Fiverr are worth their weight in gold and free up time for me to spend on other areas of the business. If you have a good client, and your solutions fit nicely, try and replicate that client. It might be a certain business type, for example. I would say about 60% of my clients are IT focused companies. Working with those businesses has increased my knowledge of that sector and I give a good impression to prospects in that sector, as I can ‘talk their language’. I’d hope that employee number one would be on board and the business will have seen some growth, both in terms of clients and revenue. He’s done so well, hasn’t he! I am particularly impressed at Matt’s organisation of his life and business; phone calls are very important to a business like his and it’s great that he’s found a seamless solution to that and his financial arrangements. Well done to him! I do like a -us or -ous distinction that’s not just talking about American versus British English, and, well, enjoyed wouldn’t be quite the right term, would it, did some writing about this when I covered mucus or mucous. So here’s another pair of words that sound and are spelled almost the same but don’t mean the same, and you wouldn’t really want to mix them up, would you! Viscus, it turns out (I didn’t know this off the top of my head. One of the most important rules of being an editor is know when to look things up, and I always check even the ones I think I know in several resources before posting these articles) – is the singular form of the word viscera (which is the word for the internal organs, particularly those in the abdomen).